Meet the ultimate in pocket-size versatility, the COOLPIX S9900. Bring home amazing photos and Full HD 1080p videos of your travels with a powerful 30x optical zoom telephoto lens with Vibration Reduction (VR), built-in Wi-Fi® and Near Field Communication technology (NFC)**, onboard GPS, a swiveling high-resolution LCD and much more. For those who want creative control, the COOLPIX S9900 features a PSAM mode dial and advanced capabilities. For those who want point-and-shoot ease, Scene Auto Selector takes all the work out of capturing great photos and videos, even in low light. And when it comes time to share your beautiful images, pull out your compatible smartphone and get the photos you took with the COOLPIX S9900 right there in the palm of your hand—ready to be texted, emailed or posted online. Every COOLPIX is designed around a genuine NIKKOR glass lens, the legendary optics that have helped make Nikon famous. The COOLPIX S9900’s 30x optical zoom lens goes from wide-angle—great for portraits and landscapes—all the way up to telephoto—great for closeups of sports, concerts, nature and more. When you need even more reach, zoom up to 30x with optical zoom and 60x with Dynamic Fine Zoom, an enhanced digital zoom function that effectively doubles your reach. The COOLPIX S9900's large, Vari-angle LCD display makes it easy to compose your shots or monitor your video recording. Reviewing and sharing your creations is a pleasure, too—every shot looks fantastic on the display. Quickly and easily send photos wirelessly from your Wi-Fi & NFC enabled COOLPIX S9900 to a compatible smartphone or tablet± using the Wireless Mobile Utility app. Share your great photos on the go, even in remote locations, or use a smartphone or tablet to control your camera. Relive the excitement of your travels in a whole new way. The COOLPIX S9900 records the exact location of each shot you take, so you can follow the path of your adventure and every stunning view along the way! Share your journeys on Google Maps™, Google+™, and other social networking sites, or with Nikon View NX2 software. Built-in mapping and Electronic compass also help you navigate unfamiliar destinations, and Points of Interest (POI) show you nearby photo-ops like scenic lookouts and historic landmarks. 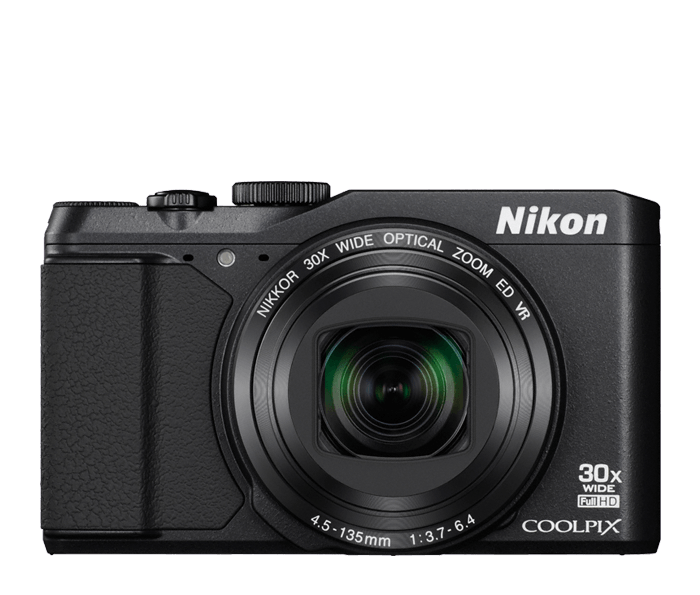 The COOLPIX S9900 is the ultimate travel companion! The COOLPIX S9900 can go as far as you want to go. For advanced shooters, a PSAM mode dial is available right on top of the camera, much like a DSLR. Control the COOLPIX S9900's aperture and shutter speed to shape your shots exactly as you want them or overcome difficult shooting situations. But you don't have to understand exposure controls to get great results—the COOLPIX S9900 can do all that work for you. At the touch of a button, the COOLPIX S9900 becomes a versatile Full HD video camera. Capture the sights and sounds as 1080p videos with stereo sound. Apply creative effects, combine short video clips into a 30-second montage, even create amazing time-lapse movies right in the camera. Once the COOLPIX S9900 and your smartphone or tablet are connected using the Wireless Mobile Utility app, you can use your smartphone as a remote monitor for the COOLPIX S9900. See what the camera sees and take pictures—great for selfies and group shots that actually include you! It's frustrating when a smartphone camera focuses on the wrong thing. With the COOLPIX S9900, Target Finding AF quickly determines your intended subject and puts the focus where it belongs—on your subject.